The 2019 Summer Meeting will be held in Marietta again this year! The event will begin on Wednesday, July 17 with the ever popular riverboat cruise on board the Valley Gem Sternwheeler. Thursday, July 18 will include a clay shoot at Hilltop Sports in Whipple, and a golf outing at Lakeside Golf Course in Beverly followed by a steak dinner and awards banquet. Details and registration information will be coming soon. The National Association of State Foresters' Forest Markets Committee releases a Weekly Newsletter full of all things Forestry and Forest Products Industry related. Each week’s newsletter has articles about: Forest Markets, Housing, Working Forests, New Products and Technology, and Renewable Energy. This week’s newsletter contains an interesting article about America’s top 20 private landowners. You may be surprised at how many of them are in the timber business. See the complete newsletter. The ALC is the only national organization focused solely on advocating for the logging profession. Quoting from ALC’s website; “ ALC is the only national organization solely dedicated to representing the independent contract logger on the national level. We have the combined forces of independent contractors and state and regional logging associations around the country to impact our industry positively and pro-actively by sharing the benefits of education and training opportunities, networking, research, promotion and legislative coordination.” The Ohio Logging Standards Council recently voted to join this organization and will be represented on the ALC Board of Directors by LSC Chairman, Ryan Redoutey. Ryan recently attended the ALC Board of Directors meeting in Washington D.C, where Ohio’s LSC membership was officially accepted. Ryan was impressed with the organization, structure and focus of this group, and looks forward to continuing to work with the ALC Board to benefit the logging profession in Ohio. For an example of the work ALC is doing, read the “As We See It” article by ALC Executive Vice-President, Danny Dructor, concerning trucking regulations, that was recently published in an edition of the Great Lakes Timber Professionals Association magazine. Read the April 2019 edition of the NEOFA newsletter. It highlights their upcoming Annual Banquet and Auction on April 26th (see Banquet RSVP form), and recaps a presentation by Ryan Clester, Forester for the Ohio Division of Forestry, on Oak Wilt Disease. Susanna Pugh and her husband, Melvin, own Emerson Park Tree Farm, just southeast of Akron, Ohio. Susanna took an interest in all the unique pieces of wood left over from timber harvests on their property and began a path towards turning leftover pieces of “junk” wood into a business. Learn more about Susanna, her Tree Farm, and the business she has started using unique wood pieces in the article that was recently published in the Sawmill & Woodlot Magazine. Properly pruning fruit trees allows for the suns energy to go into producing larger, sweeter fruit instead of into unneeded shoots and branches. Read a good article explaining these principles that was recently published in the Morning Ag Clips Newsletter. Read the East Central Ohio Forestry Association May 2019 Newsletter. As always, it gives reports from their previous meeting, which was highlighted by talk from Frank and Bernadette Skalak about their trip to Costa Rica, as well as a schedule of upcoming events. Do You Know The Stats on Pallet Recycling? Many of you in the industry already know that Ohio is one of the largest pallet producing states in the U. S. In fact, according to Bureau of Labor statistics, Ohio ranks 3rd in the nation in the number of employees in the pallet manufacturing industry at around 3,800 workers. But, are you also aware of the fact that 95% of all wood pallets are recycled at the end of their life cycle? A study by the U.S. Forest Service shows that this percentage is reached because the wood fiber in used pallets is reclaimed and recycled to make mulch, animal bedding, biofuel, and other products. 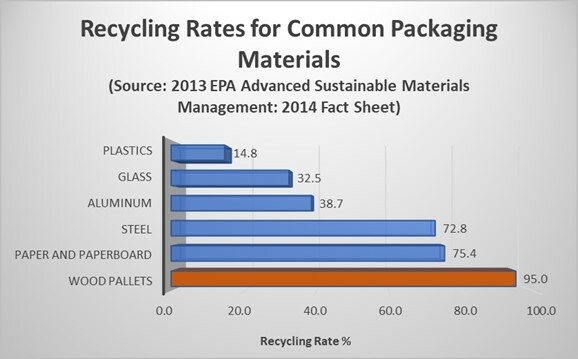 See how other packaging materials stack up against wooden pallets in the following chart. Here is OFA’s BWC Group Ratings provider, CareWorks, newsletter full of BWC information. This newsletter announces Risk Management Cost Control Seminars, talks about the 20% Reduction in BWC Rates for Private Employers, and other important BWC info. Read the newsletter for all the details, and see the CWC Seminar Flyer for registration for the Risk Management Cost Control Seminars. MRWIG has distributed their March/April 2019 newsletter. Read the newsletter to see their upcoming schedule and other news, which includes articles on Poppin’ Mushrooms, an Ode to the White Oak, and their upcoming trip to Goll Woods State Nature Preserve & Kitty Todd State Nature Preserve. A recent article in the Morning Ag Clips Newsletter talked about research being done by a company called BioCarbon Engineering. They have developed a process whereby drones can be used to fire pre-germinated seed pods into the ground. This process was successful in Myanmar where Mangrove saplings planted this way in September are now 20 inches tall. 2 trained people operating a fleet of 10 drones could plant up to 400,000 trees per day. This far exceeds what humans could do at a fraction of the cost. Read more about this technology.